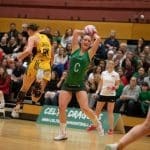 It was a classic game of two halves as Cardiff welcomed the Vitality Netball Superleague back for the first time in 2019 and Celtic Dragons took on newly-rebranded Saracens Mavericks. It was a poor start from Dragons whose first centre pass fell into the hands of the visitors and within five minutes, Mavericks had a five-goal advantage. 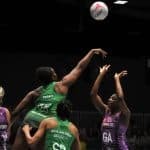 Heads could have dropped after such a nightmare start but the Dragons remained focused and with captain Nia Jones directing the Dragons relentless drives up court. Chelsea stood firm at goal and with seconds left, much to the home crowds delight, Kalifa made an interception and the Dragons were right back into the game. 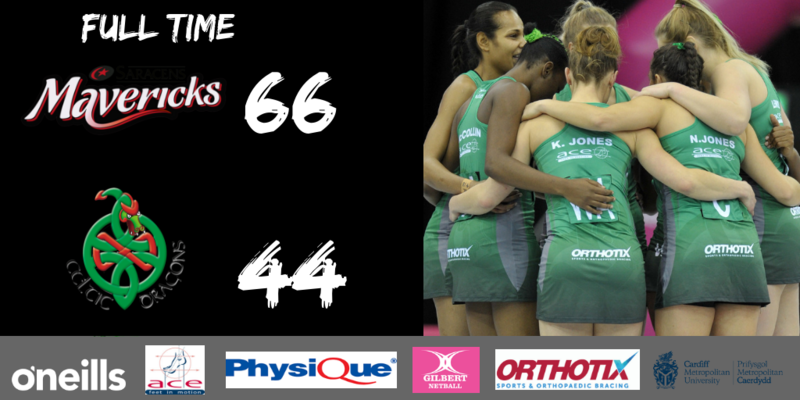 Celtic Dragons made a far more assertive start to the second quarter, Chelsea scoring in the first 10 seconds. Kalifa continued to busy herself across the court as Kyra relentlessly chased after every Mavericks ball. A highlight of the quarter was when a long ball up court look set to go into the stands, only for Chelsea to use her trademark reach and athleticism to keep the ball in play with Suzy scooping it up and powering it into the circle. As the quarter drew to a close, the Mavericks defence tightened up and at the half the visitors were able to extend their lead to 5. Dragons were still very much in the scrap coming back onto court after half time, but a Mavericks interception set the tone early and helped the visitors’ lead extend to 8 within seconds. Dee made a critical interception for Dragons to attempt to stem the Mavericks onslaught but errors were creeping into the Dragons centre pass and Mavericks’ outstanding shooter George Fisher was rock steady in front of goal. Clare Elsley came on for Dragons but by this point the visitors were into their stride. Quarter time came and Mavericks had broken the back of the game with a lead of fifteen as the Dragons were left to contemplate missed opportunities. Head Coach Tania Hoffman made some changes in the final quarter, with Abby and Eleanor taking to court, but the game was gone and Mavericks were able to add a few more to their tally, with Mavericks goal attack Kadeen Corbin scoring 21 of 22 in the match. Celtic Dragons now have a quick turnaround in training this week with a big away trip to Scotland to play the University of Strathclyde Sirens in Glasgow on Friday night. Updates will be available via Celtic Dragons social media. Saracens Mavericks: GS G Fisher, GA K Corbin, WA G Lees, C S Corbin, WD M Drayne, GD L Keable, GK R Quashie. Replacements: S Collard, B Ecuyer-Dale, E Kelk, P McCalla and J Trip.